Love Lake Garda’s mission is to attract as many visitors as possible to one of the worlds most beautiful and diverse holiday destinations. Not only do we want to provide you with information to make your holiday more enjoyable, but also make it easier to plan and book your entire holiday. We have partnerships with booking.com for hotels, HomeAway.com for apartments and villas, Canvas for camping and Rentalcars.com for your hire car. And now, for those who don’t wish to drive, we are pleased to announce a new partnership with Omio which will make it easier for you to book trains, buses and flights to Lake Garda. 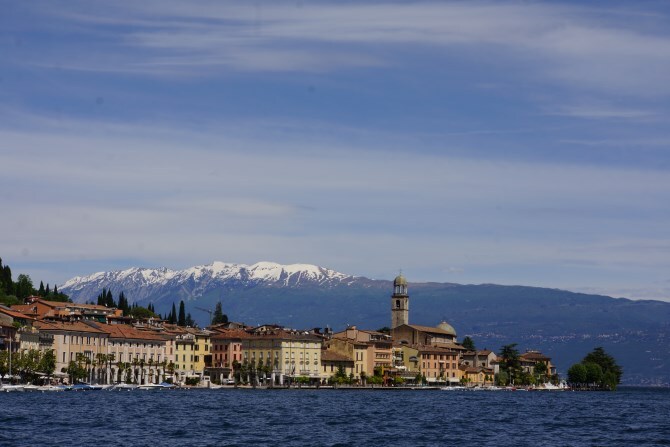 As you can see from the photo at the top of the page, which was sent to Love Lake Garda by George Cooper, Lake Garda is a stunning place to visit. But did you know that it has excellent connections via train and bus to some of Italy’s most famous cities, such as Venice, Verona, Padova, Milan and Florence. For some time now Love Lake Garda has been in partnership with Isango who provide organised sightseeing trips and tours to these iconic places, and now our partnership with Omio will make it easier for you to plan your own day trips. A simple search box allows you to simply enter your departure point, which in Lake Garda will probably be Riva, Desenzano or Peschiera, and your destination. Enter your date of travel click search and your will very quickly be shown a list of trains times, journey times and cost, which makes it easy for you select the journey that best suits you. The ease of getting to Lake Garda, by air, car, train or bus and the fantastic bus and ferry companies that service the lake, makes it a very attractive destination. You can easily book cheap flights into the Milan airports of Malpensa and Linate, and also the closer Bergamo aand Verona airport using Skyscanner , and now with GoEuro, you can book flights and your onward transfer to Lake Garda. Of course its not just Lake Garda that Omio are connected to, they have over 600 official partners to help you choose the cheapest and fastest routes all over Europe. With a dedicated Customer help center and a ticket cancelation portal, the trip doesn’t end with the purchase of a ticket, they are with you all the way. Once you’ve selected your journey it’s a simple process to book. Simply enter the passenger details, then proceed to the payments page which takes all major cards and also PayPal. If you prefer to travel by coach or bus just click on the Bus tab at the top of the page. It really is a simple process and much better than trying to navigate the train and bus companies individual Italian websites, or trying to book tickets at the station on the day.